Chicken and shrimp are surprisingly harmonious when combined in a dish, and this recipe is an excellent example. 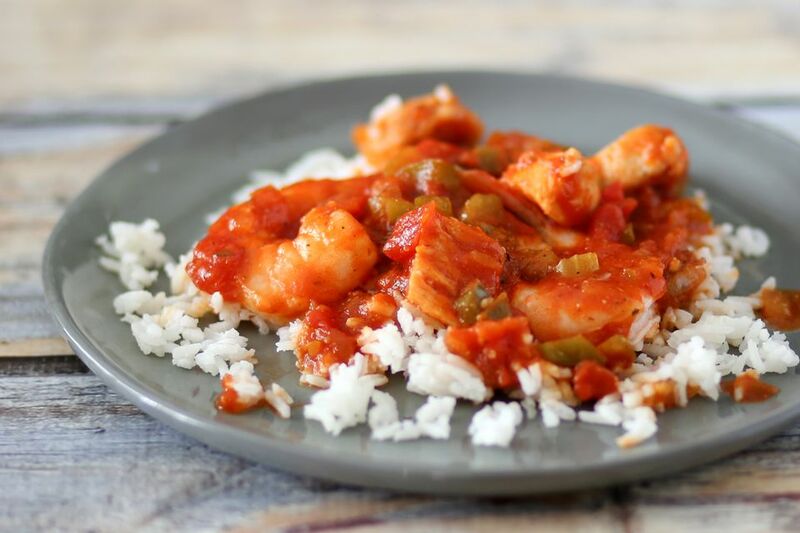 Make this incredible chicken, shrimp, and rice dish for any night of the week, or for a special occasion. The addition of shrimp completes the combo nicely, but if you don't care for seafood or have allergies, go ahead and leave it out. Just double the amount of chicken in the recipe. And feel free to add more shrimp and chicken or double the recipe for hearty appetites. A Caesar salad or dressed spring greens would be perfect with this dish, along with garlic bread or crusty rolls. The ingredients are adaptable as well. Jalapeño peppers add flavor and heat to the dish. If you aren't a fan of spicy peppers, use Anaheim chile peppers or omit the jalapenos. Or add an extra 1/2 cup of colorful sweet bell peppers. The recipe calls for fresh diced tomatoes, but if you don't have them, use 2 cups of canned diced tomatoes—or petite diced—if you'd like. The sauce mixture can also be an excellent way to introduce extra vegetables to your family's diet. Saute some shredded or matchstick carrots and thinly sliced celery along with the chicken. Or add about 1 cup of seeded diced zucchini or yellow summer squash. If you don't care for rice or don't have it on hand, it would also be excellent spooned over angel hair pasta or spaghetti, or serve it with polenta or grits. Cook the rice as directed on package; fluff it and keep warm in the rice cooker or cover and keep warm in a 170 F to 200 F oven or warming drawer, or transfer ​the rice to a slow cooker with a warm setting. Cut the chicken breasts into 3/4-inch pieces. Remove the seeds from the chile peppers and mince. Heat the olive oil in a large skillet over medium-high heat. Add the diced chicken, jalapeño peppers, bell peppers, kosher salt, pepper, and crushed red pepper. Cook for 4 to 5 minutes, or until the chicken is cooked through and no longer pink, stirring constantly. Add the shrimp and continue cooking for about 2 to 3 minutes, or until the shrimp are opaque and pink, stirring constantly. Add the fresh chopped tomatoes or canned tomatoes and the tomato paste, if using. Cook for about 1 minute longer, or until hot and bubbling, stirring occasionally. John Tharpe's Note: You can easily omit the shrimp from this recipe. Just increase the amount of chicken to one pound for a full recipe.